Africa is about epic journeys, walking in the footsteps of explorers, majestic landscapes and the fascinating cultures - and it screams out adventure. across the Okavango, quad-biking to camp in the centre of a salt pan, or a mini-escape to a remote ranch. It does not have to be about the adrenalin rush... but it can be. 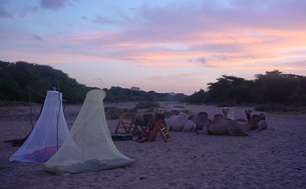 Opt to walk or even ride between camps, spending a few nights in the bush en-route. The easiest ways to inject a slice of adventure - swop your fluffy pillows for a night fly camping. Nothing beats building a fire and sleeping under the stars for the night - cub scout style! Take a dawn flight around the peaks of Mount Kenya, touching down for a champagne breakfast. 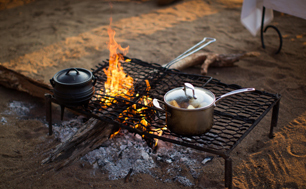 Canoe Safaris - Zimbabwe/Botswana 3 nights on the river, camping at a different site on the banks each night. 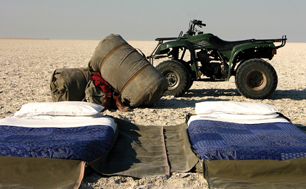 Quad Biking Safaris - Botswana 2 night adventure across the vast salt pans, sleeping on roll mats under the stars each night.